Colonia del Sacramento - invitaion to Uruguay for a trip to the frozen-in time Colonia Antigua, its cobblestone streets, colorful houses and atmosphere of peace and tranquility. Colonia del Sacramento: Where to calm your spirit? Usually it does not take long to realize that Buenos Aires is one of these never sleeping cities. In fact, after spending a few days I this vibrant metropolis, tourists increasingly begin to feel a need to slow down, “put the brakes on,” and relax! It’s often true – to your great surprise, you may find yourself dreaming about a day without bullet-like collectivos running down the streets or nights without milongas. Well, if this phenomenon does occur, there’s no need to panic! The good news is that Buenos Aires (as expected from a world-class capital city) offers a plethora of activities – some intense and full of adventure, and some that move at a much slower pace. If you’re looking for “micro-relaxation,” there are secluded places nestled within the city itself, such as the Botanical Garden near the Plaza Italia. You can also catch your breath (and also clear your lungs) in the spacious wilderness of the Reserva Ecológica Costenera Sur (Costanera Sur Ecological Reserve) just behind Puerto Madero. However, to really calm your spirit, lower your level of adrenaline and recharge your batteries, you may want to venture just beyond the city’s perimeters for more exotic, old-world pleasures. A mere 30 km (18 miles) from the Retiro Terminus station lies a vast area of pure nature at its finest – Delta del Tigre. This “land of water” consists of thousand and one (or more) islands separated by a labyrinth of canals, streams and rivers, largely in the state of “virginity” despite the close proximity to the Federal Capital of Argentina. Here you feel as though you have stepped inside a secret world of peace and serenity…..
Another place sure to calm your body and mind is Colonia del Sacramento – a small town located in Uruguay across the Rio de la Plata. A one-hour trip by speedboat from Puerto Madero takes you few centuries back to an old Portuguese town where the time seems to have stopped. Everything here runs at much slower pace, and the streets, buildings and the very atmosphere are immediately reminiscent of the distant past. However, you may ask, “Why is this Uruguayan city listed on a website dedicated to Argentina?” The answer is simple – Buenos Aires is much closer to Colonia than Montevideo; it is a much more populated, larger tourist center than the more peaceful Uruguay, so naturally, it is a pleasant jaunt for a one-day trip for those who seek relaxation and a change of pace. Our Uruguayan neighbors and visitors shouldn’t consider this inclusion of Colonia del Sacramento on the tourist map of Argentina as an attempt to “revise the borders.” In fact – Colonia has been part of Spanish-speaking Uruguay since its independence in 1828! Colonia del Sacramento: Historical Facts. Colonia del Sacramento is the oldest European town in Uruguay. The settlement, initially known as Nova Colonia do Sacramento was founded in January 1680 by Manuel de Lobo, a Portuguese administrator and the governor of Rio de Janeiro. However, due to its strategic location as well as its enticing conditions for smugglers, the land rights to Colonia were hotly contested by the Spanish and Portuguese crowns. By mid-1680, the settlement was overtaken by Spanish forces in a bloody battle, and Manuel de Lobo was imprisoned (he died three years later in Buenos Aires). But that was just the beginning – over the next 150 years, the city’s government changed rulers’ hands 12 times until 1828, when it became part of the newly created Uruguay. Mural from ceramic tiles made by a local artist Ariel Chape. 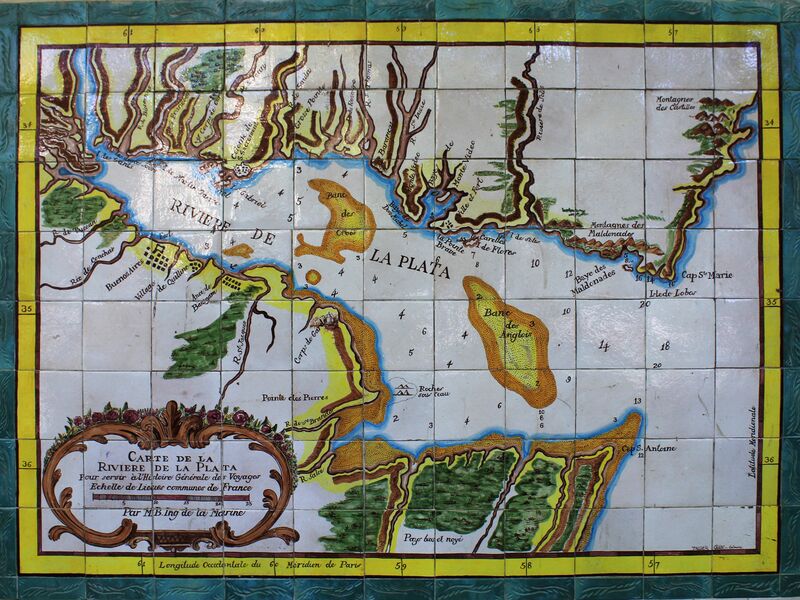 It reproduces an original French map of the Rio de la Plata from 1740 published in "L'Histoire de voyages de M. Bellier". Click on the picture to get its full size version! Despite the complexity of its colonial past, Colonia’s historic center (Barrio Historico) retains a very strong Portuguese footprint. Irregular cobblestone streets lining the old town’s uneven terrain clearly contrast those of most Spanish cities, with highly symmetrical, orthogonal street patterns. Connoisseurs often note Colonia’s striking resemblance to the old city of Lisbon (destroyed in 1755 by a disastrous earthquake and subsequent tsunami). 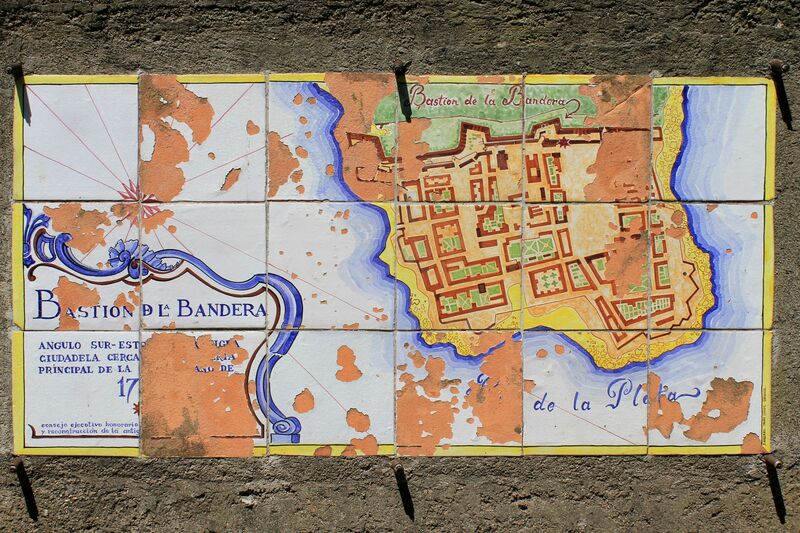 Mural made from ceramic tiles presenting the plan of 18th century Colonia del Sacramento. Perhaps it is due to this strong Portuguese influence that Colonia’s main plaza is still called “Plaza Mayor” (Main Square) instead of “Plaza des Armas” (quite typical for the majority of central squares in former Spanish colonies)? Thanks to the uniqueness of this colonial past that seems so frozen in time, in 1995, Colonia’s Barrio Historico was declared a UNESCO’s World Heritage Site. The old Colonia (Colonia Antigua) is located at the tip of the San Gabriel Peninsula. From the mainland, the original settlement was protected by a stone wall with several defensive bastions. Today only a few remnants of the bastions of de San Miguel, San Juan, Bandera and del Carmen remain, though they are largely in ruins (actually these days some bastions exist only in a “collective memory” of Colonia’s residents). Frankly, only Bastion del Carmen survived its past, though in a largely modified shape. It was first used as a soap factory and later converted to the Teatro del Bastión del Carmen – an institution that hosts expositions, artistic events and conferences. In its earliest years, the only land entrance to Colonia was provided by a City Gate (Puerta de Campo) and a wooden drawbridge over a moat. From the water, its defense system consisted of the stand-alone bastions of San Pedro and Santa Rosa, together with flanking the defensive wall on the north and south - bastions of del Carmen and San Miguel. Although this mid-18th century defensive system provided good protection from local caudillos, ambitious hidalgos, native Indians or even pirates, it was no match for the appetites of large colonial powers. History has proved several times that Colonia’s destiny was to have been determined somewhere else – either on remote battlefields or during negotiations and peace treaties. Though this is a precise, albeit abbreviated “picture” of Colonia Antigua from its days of glory and importance, it may be difficult to determine just when its “golden age” came to an end – but the fact remains that by the mid-20th century, the city was in ruins. Stray dogs, prostitutes and their customers roamed the streets, and the entire area was claimed by nature in its least friendly form – weeds. It had become a forgotten place, or at least the last place one would choose to live, much less visit. Then, what still seems like a miracle to its residents, the Government of Uruguay decided to restore the historical part of the city. As part of the restoration program, a small section of the defensive wall, including the main gate and the drawbridge, was rebuilt, highlighting the city’s unique past. For tourists, the Puerta de Campo marks the beginning of Colonia’s historic district. As you take those few steps to cross the gate, you are literally “transported” to a different time. Entering the Plaza Mayor and surrounding streets offers you a fascinating glimpse of a long-gone era, yet still seemingly untouched by the hands of time. Colonia del Sacramento: Gallery of Pictures. View on Puerta de Campo and a section of restored defensive wall. Left - inscription pointing out that crossing the gate you enter La Antigua Colonia del Sacramento. Colonia's landmark street - Calle de los Suspiros (Street of Sighs). Renovated streets in Colonia Antigua. Left - Hotel "La Misión" on the Plaza Mayor in Barrio Historico. Right - Casa de Nasarello represents a typical Portuguese house from the 18th century Colonia. It preserves the original structure, stone walls and tiled roof. The house was restored in 1993 thanks to La Fundación Calouste Gulbenkian. Just as you pass through the gate on the left, you will see a landmark street upon which many generations traversed during the ever-changing times in the history of Colonia – the Calle de los Suspiros (Street of Sighs). This typical Portuguese street is paved with its original cobblestones and is shaped to direct rainwater down to the river. Flanked by similarly old but colorful houses, the street, despite its apparent state of “disrepair,” has on overwhelming charm that instantly brings one a sense of peace…at least until your guide begins to speak. There are many stories and legends surrounding this street and its name, but I will omit them because you deserve some surprises while exploring Colonia!